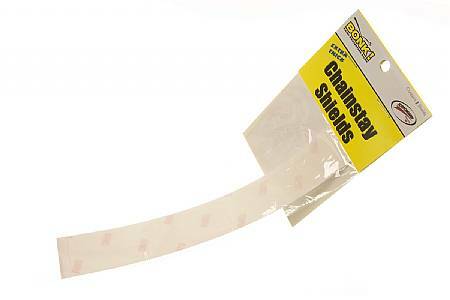 These chain-stay shields are an inexpensive way to protect your expensive bike frame. Worth the money! I put one of these on an old Schwinn that I recently restored. I wanted to further protect the new paint job from my chain, and this works perfect. Due to the transparency, you can't even tell it is on there. Good adhesion, easy to apply. Placed on an 80s road bike to keep chain stay from getting more paint nicks from chain and to soften sound when chain hits stay as it sometime does during shift. Product is thick yet molds easily, few air bubbles and no edge lift up. Price is too high in my opinion. Otherwise a good product. Sturdy protection, does not show. So far this stuff is great. Apply it and forget it. Make sure the stays are clean.